It’s first April and my ‘Healthy Living & healthy Eating’ challenge has begun. I am about to share all healthy recipes in here this month. So if you are thinking about some healthy food, all greens and soups keep coming here throughout April. What I am trying to do this month is – no processed food, no cheese, no deep frying, lots of greens and fruits. Sounds exciting? Okay, first things first, I’ll quickly give you today’s recipe that’s starting with A. What is the first thing that comes to your mind when you say A for?? Apple of course!! Thanks to my infant son I have loads of Apple lying around so it was my obvious choice. It’s super hot in India right now. I don’t know if we are again waiting for another heatwave this year. You need to keep yourself hydrated all the time and yet keep in mind about the nutrition. I have chucked out aerated beverages from my life forever and also the packaged fruit drinks. I now firmly believe in making my own beverages. 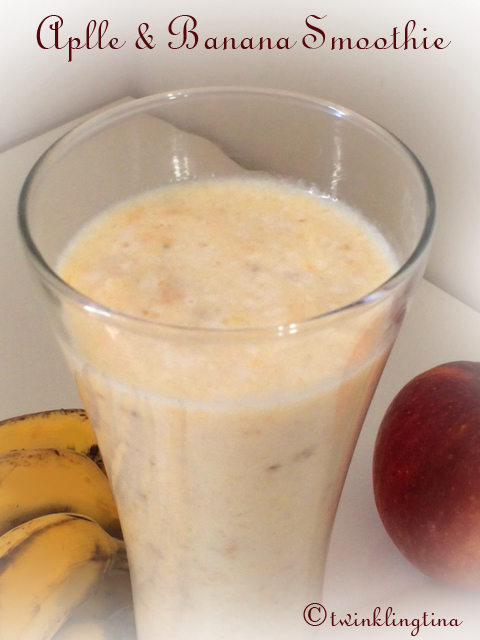 Thus today I give you Apple and Banana Smoothie! Any smoothie with banana in it is super food for you. They help in maintaining normal blood pressure and heart function. Also a great source healthy carbohydrate. Remember how athletes always munch on bananas? Apples are a good source of dietary fiber, important antioxidants and flavanoids. 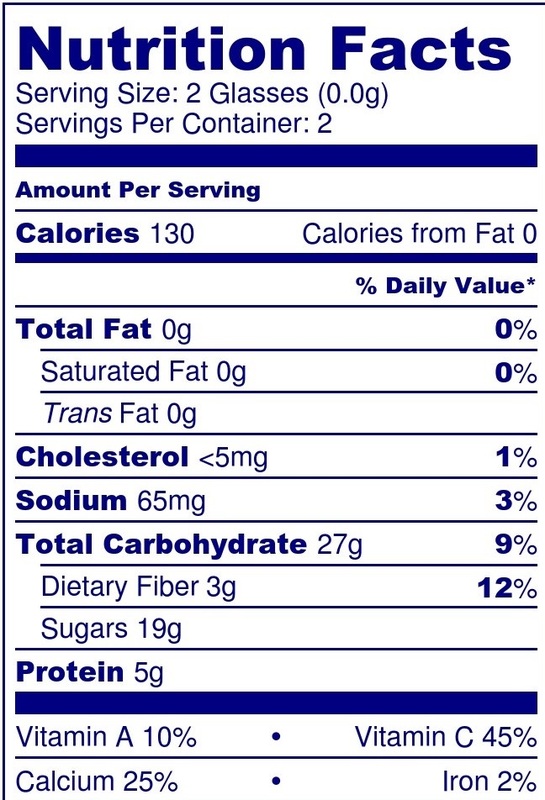 [I would suggest you skip this added sugar. Apple and Banana itself is sweet enough]. I love smoothies for this because all you need to do is blend! Blend everything in a blender and serve with some mint leaves or Banana slices! The lime juice will make sure the apple and banana don’t turn black! You can easily give this to your toddler. They’ll have a hearty snack! To a toddler mind you not an infant. Infant’s should have apples only in stewed / boiled form. That’s what my paed recommends. Enjoy a good healthy snack. P.S. How do you like my new Blog Post layout? Let me know if you are finding this user friendly. Smoothies are a quick and healthy way to add veggies, fruit, protein and probiotics to you and your family’s diet in a tasty and enjoyable way. I am going to try this recipe out very soon. 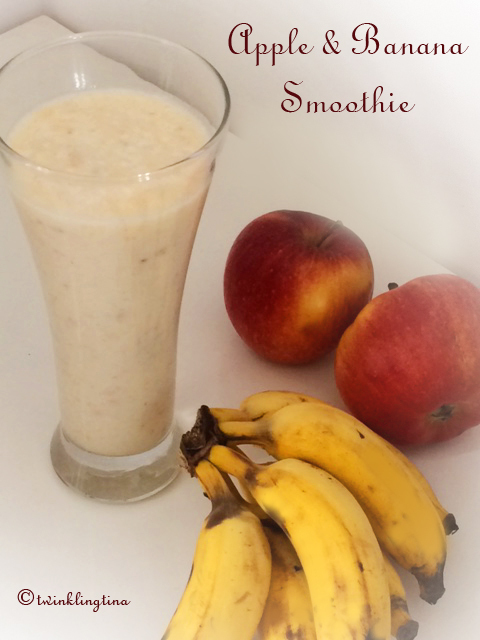 Looks good, would try it this morning but I am out of bananas, perhaps I will try it tomorrow. Healthy eating is always a goal of mine….sometimes I fail, so it is always good to collect new recipes. that's a healthy at the same time yummy go to drink this summers! Thank you Tunbugs. Healthy eating is always on everyone's list! Thanks Rajlakshmi, the lime is so tiny that you'll not even taste it. That looks yummy! And it doesn't look hard to do either. What a great recipe for the first day. Can't wait to see more. 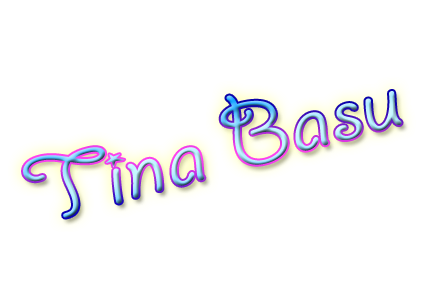 I am so pleased you visited Tina. I am always looking for sources of food and recipes, and being an ex pat Brit I love Indian food too. Your smoothie looks delicious. Thanks Srivi, do let me know after you try. That does look very delicious! I moved to a hot part of the United States (Phoenix, Arizona) so this could be good to make when it starts warming up here! Gonna try it as I am on my mission of weight gain with less efforts .ADM summer is alrdy calling me for so.e cool smoothies . Wow, looks yummy and perfect for a hot summer day. Yay, I found a food blog participating in the challenge! This looks scrumptious! Will be trying this soon!